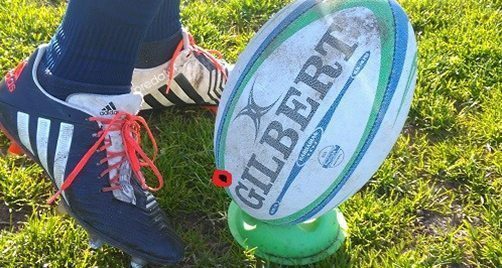 This is the first in a series of posts by former Bay of Plenty flyhalf, Nick McCashin, who is currently playing and coaching in Scotland and writing for prorugbyclub.com. Have you ever watched a professional game of rugby and specifically the goal kicker as they effortlessly slot five from five? Regardless of the crowd size, noise, weather or the enormity of the situation, they systematically go through their routine and right off the foot you know it’s going to sail through the posts. And on the rare occasion that it does miss, it bounces off the uprights. But that’s not every game. We have occasionally watched professional rugby games wherein the kicker has had an absolute shocker. They’ve attempted kicks that resemble a 25 handicapper on the golf course. Shanking it right. Slicing it left. Then over-correcting and hooking it into the drink. Sometimes the ball falls off the tee midway through their run up and they grubber it along the ground. We admire professional players who kick goals as they must have nerves of steel to step up for the team and nail the penalty or goal that will determine the game. The result can brand you as the hero or the loser. I know what it is like to be on both ends of that final kick. Most goal kickers know that misses hurt like hell. Not everyone can be John Eels. Nicknamed ‘Nobody’ because Nobody’s Perfect, Eels’ kick to win the Bledisloe Cup in 2000 has to rank as the most impressive kick under pressure in the history of modern rugby. Firstly let us take a look at the stats. If you are like me, you’ll want to see the evidence for why goal kicking is so important in rugby today. When analyzing a kick, it is important to understand what makes a kick difficult. All of these are factors that influence the difficulty of a goal kick. But when we assess the quality of a goal kicker, we usually look at just one metric, the percentage of kicks made. It doesn’t matter what happens before the kick or how it goes over as long as it goes over. For the purpose of this article that is what we will look at. 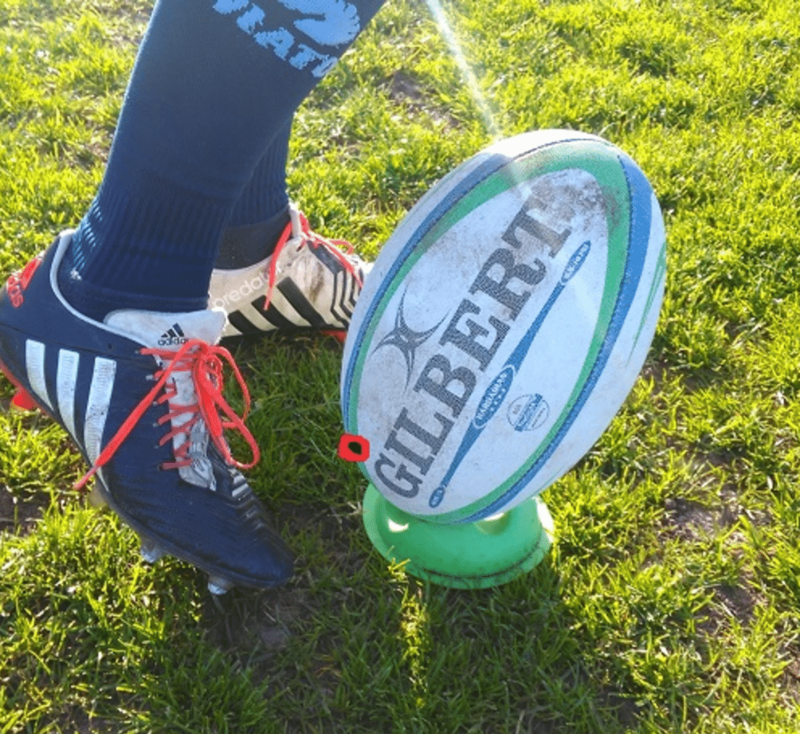 Being responsible for kicking goals on your rugby team is no easy task. There is a tendency for young kickers to watch the pros and think they need to hold themselves to the same standard. While it’s great to aim for perfection, it’s not good to beat up on yourself when you miss. Don’t start changing your technique every practice. It is not about forcing yourself to try harder or practice longer. There is a need to practice but practice the right way. Perfect practice makes permanent. Not the traditional practice makes perfect motto. With that, let’s discuss how to kick a rugby ball off a tee. You’re going to need the basics. A rugby ball and posts are good. Beyond that, whatever your kicking technique, it’s important to do the same thing every time. Same setup, same action and hopefully the same (positive) results. A good way to test the setup is to take five kicks of the ball at 5 different set up positions. Short video recordings can help you see what happens to the ball and what might be best for your kicking technique. Personally I like the ball tilted slightly forward and upfront. I use a small green Dan Carter tee with the valve pointed towards the posts. Look at kickers who you admire and asked a few questions. Why are they the best? What is the same every time? We are the similarities between successful kickers? What are the main parts of the kick? Seek advice from a goal kicker if one is available to you. Or look to speak with an experienced coach to help you. I used a coach at a certain point in my career which really helped me keep focused on improving my process to help my percentage (Thanks Dave Mays). To make is easy for anyone reading this I have broken the skill down for into segments. If you get these fundamentals right you will quickly be on your way to kicking five from five. IMO, this is the best way to practice rugby goal kicking. Every goal kicker will have their own unique set up which will suit their style and action. A good tip here is to line the ball up with the seam and valve facing away from you and towards the goal. Having the seem and valve away from you helps with consistency as the inside of the ball is different around the valve. Some players like to have the ball slightly tilted to one side to combat the natural curve you produce after the kick and the pivot of the hip. The tee choice is merely a preference for the setup and individual. For example the tee is used if the player wants the ball set higher, lower or to stand upright or to lean it further forward. My personal preference is to have the ball slightly tilted forward and away from me. I use a low set kicking tee as when I was younger I learnt to kick off a crow’s nest made from the grass or sand. Every player has a unique style before their run up and a classic example of this is Jonny Wilkinson. He adopts a powerful stance, elbows tucked in and hands held together almost as if he was praying before he kicks. A lot of these physical movements are simply to get the body and mind ready for the kick. More often than not the kicker would kick through the ball from a 45 degree angle. They use several steps towards the ball to help get the timing right. Notice in the photo below that I aim with my right eye so set up with right eye in line with the ball. The opposite foot should always be placed directly alongside the ball about a half a foot. The angle of this foot should always be pointing in the direction of the posts. Angled out it would go left and angled in it would go right. Having the foot placement to far forward with decrease your power and having it too far back with make you kick further up the ball with less accuracy. The kicking leg should always connect with the same point on the ball. Normally it is around a 1/3 the way up from the base of the ball along the seam. Depending on your setup this can change. After the strike every goal kicker needs to follow through the line of the ball. This helps accuracy, consistency and power. Some players however to fall away to the side of the ball instead of in front of the ball. If you swing through the ball and finish in front more often than not you would achieve greater distance and a higher level of accuracy than those that fall away to the side. Notice in the below photo that the finish is past the tee and through the ball. Hips are facing towards the posts and where I want the ball to go. Following the basics of rugby goal kicking you can improve your technique dramatically. There are lots of others things you need to get right which include the way you practice and mindset. If you are a kicker everything has to be positive. Regardless whether you miss or slot the kick, each kick you learn what worked well and what didn’t. When we break the skill down into 6 key points we can focus on improving each step which will help you with your consistency and accuracy. Practicing and evaluating only six things after each kick will allow you to critique the part that was not performed so well and you can improve it for the next kick with being too overwhelmed. Mastery of the fundamentals can improve your kicking from 50-70% in the season to 70-80%. Combined with the right mindset and practice there is no reason why you can not achieve 80% or higher in your game. Continue to focus on improving and getting better with each training session. Practice at every opportunity prior to training or after even if it is only 5 to 10 mins. In our experience limiting the amount of kicks to 20 gives us a goal and an end point. During practice you should always finish on a good kick so that we internalize the correct technique. Five minutes prior to your game is always beneficial to get the body primed. All kicking techniques can be learnt and passed onto other players. Some players think they can kick but in reality they can not kick to save themselves. We believe anyone can learn to kick in a short space of time with the right frame work and be successful on the paddock. To improve your goal kicking do not skip leg day. 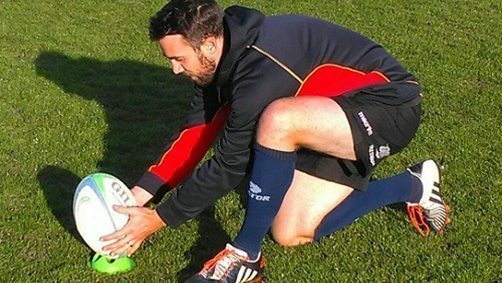 Seriously strengthening the legs can help with correct muscle function, kicking technique and power in your goal kicking. While you cannot go past the basics such as the squat or the dumbbell walking lunge here are our favorite exercises in the gym or weight room to help improve your goal kicking. Rotational Squat – Very good for that twisting motion similar to a kick. Helps you develop power around the hip. Single Leg Deadlift – Helps strengthen hamstrings and balance to avoid injury. Clams – It is important to have strong glutes and that includes the smaller glute muscles. Always incorporate a good warm up and warm down in your training sessions as it will help reduce the risk of injury. Kicking along the try line from the touchline at a single goal post helps a goal kicker work purely on the fundamentals of the kick and the flight of the ball from the kicking tee. Learning how to master your technique and the fundamentals so you can accurately and consistently kick straight. When you can hit the single post time and again you are on the right track. By focusing on the kick and not the final result can help you stay present within the kick and perform better on the field. If you are having trouble with your power or follow through here is a good drill. Prior to your kick mark the ground in front of your tee as to where you would like to finish your kick. Focus on kicking through the ball and not worrying so much about the result. The idea is to practice finishing on your mark ahead of the tee. If you are having trouble with your connection and sweet spot here is a good tip. 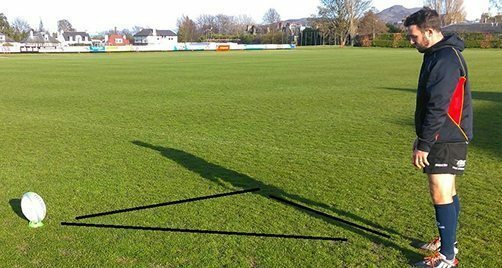 Once you understand your sweet spot depending on your kicking style and ball set up mark the ball with a permanent marker. Drawing a black circle on the ball with help you hit the mark every time with more consistency. As a goal kicker it is always good to test yourself in mini competitions after your team practice. If you are alone try to create scenarios in your mind and certain kicks you might have to kick in the future. For example the World Cup final winning conversion. By doing this in your mind if you ever get the the World Cup and you have that kick to win the game you will be confident you have kicked it over a hundred times in practice. If your team has finished training it is always good to have a kicking competition. Some of the forwards will love this. It is hard to replicate the same pressure you have in a game so kicking with team mates or friends can help apply a little extra pressure. To make it even more interesting I recommend adding stakes. The winner of the competition gets beer, chocolate bars or some fancy nutrition products. To win these competitions as a kicker you need to have done the work and trust your ability. Good luck with your future success and hustling your team mates.